Prior to implementing a Salesforce CRM system, mapping our clients unique processes is needed in order to understand and simplificate the operation with personalized solutions. CRM systems work best if they’re tailored to your business needs. We pay special attention to customize Salesforce to your corporate processes, so you can achive the most benefit of the systems incredible capabilities. We continuously train our colleagues to source our customers with the best quality experts during the implementation of the system and business processes. Every industry comes with its own model of customer relationships. 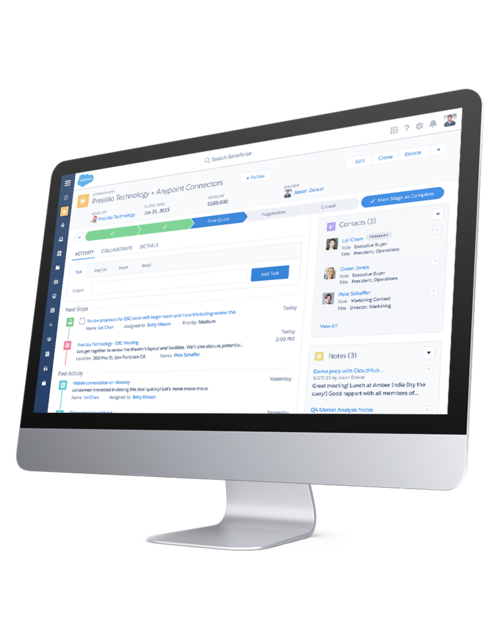 We know how to incorporate it flawlessly into powerful Salesforce CRM with more business impact. Implementing a new system gives your company great benefits, but to get the best out of it, we must keep an eye on the well-tried former systems that remain and need to be integrated with Salesforce.